DRM is a thorny issue with many computer gamers. It is tolerated where it works without popping up its ugly head too conspicuously but presents an extra level of complexity for things to go wrong, causing software issues, for instance. In the former camp most Steam users feel the platform operates slickly and its convenient features are a counter to its underlying DRM functionality. In the latter camp gamers have been stung when Windows is updated, for example, and an old DRM system locks users out from enjoying a classic game which they own. CD Projekt co-founder Marcin Iwinski thinks the solution to the old DRM vs piracy debate is simple – don’t use DRM and reap the benefits of winning favour with pirates and end users – your game buyers. Further convincing is done on behalf of CD Projekt by fans of the game, acting like anti-piracy foot soldiers. Every free dodgy download request is countered 10:1 by forum users, bashing the person seeking something for nothing and recommending purchasing the game, says Iwinski. Considering the above, CD Projekt Red’s case might not be typical for the industry. 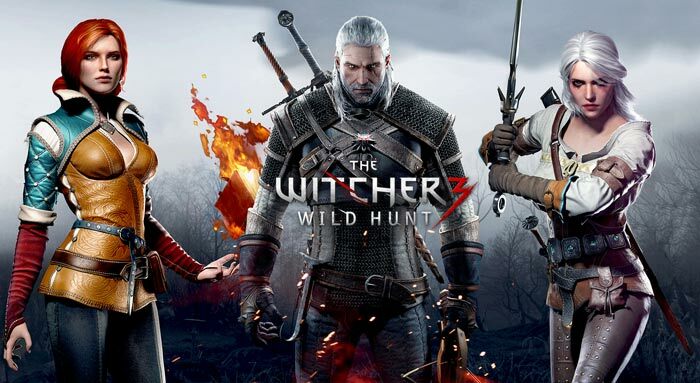 The Witcher 3 is, according to its Metacritic score, the best PC game every released. If the game wasn’t such a gem perhaps people wouldn’t feel the carrot was so attractive? So it will be interesting to see if this games developer can repeat its piracy-curbing success with the upcoming Cyberpunk 2077 game. The Witness is the latest Epic Games Store freebie Battlefield Currency, based on real money, goes live CD Projekt Red claims that "we leave greed to others"
Here's the thing: Objectively speaking, the witcher 3 is far from the best game of all time. It's combat isn't superb, it had the controversy surrounding its graphical downgrade (though it still looked good), it suffered a pretty hefty delay, and was quite buggy at launch. But in spite of this it's warmly received by the community - simply because they offered so much in the base product, they worked hard to patch the game, they offered small bits of free dlc weekly after release (things most companies would have been happy to sell for $3-5 each). They offered it not just on steam, but across all major pc platforms, be it steam, origin, or drm free through GOG. Their expansions were both excellent and offered more for their $10 and 20 price tags than most full priced games. They encouraged modding (though admittedly their modding toolkit was pretty limited compared to what bethesda would generally offer). And that's on top of the game itself being fantastic, combat and launch issues aside. So I'm not quite sure if it's that the being highly rated lets them skip the drm and be successful, or if perhaps CDPR actually seeming to give a damn about the paying customers helped elevate the game's standing. 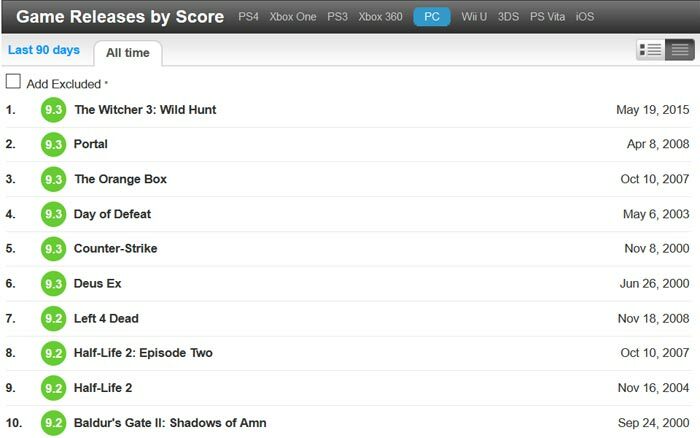 Seperately, I think the most interesting thing about metacritic's top list is that to find another new game in that list that was made after 2010 even, one has to go down to number 32! Nostalgia or are games these days just not that good..? I'm broke as hell but I adamantly refuse to pirate The Witcher 3. They seem to care. That goes a long way. Their strategy works right now by contrast with the rest of the industry. They stand out as “good” vs “bad”, and that wins them respect among people who would otherwise be taking games for free. However, if this approach was adopted industry-wide, I'm not sure the users would extend that same gratitude to every game, and certainly not in perpetuity (generation to generation). Users would come to regard games in the way they do music, where some continue to pay but many more expect access to everything at little to no cost.